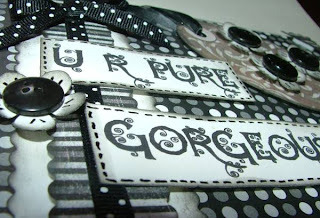 Ingredients: PP by Anna Griffin and TLC, felt shapes by ELC, sentiment by Brenda Walton, vintage button and ribbon, ricrac, Fiskars scalloped scissors and hand doodling. 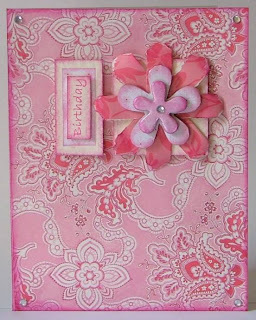 Ingredients: PP by Anna Griffin and TLC, flower punch by Xcut, sentiment by Brenda Walton, ribbon, diamante, Fiskars scalloped scissors and hand doodling. Just checked out the Caardvarks blog, and my name was pulled out the hat for a RAK! can't wait to see what it is! I really enjoyed it, thanks from the challenge Caardvarks!!! 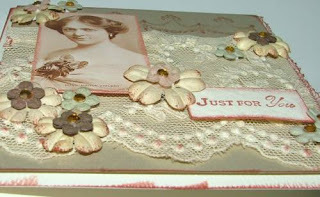 Ingredients: PP by Basic Grey and DCWV, font is Dearest Dorothy, ribbon, doodled 'stitches' vintage buttons and Xcut flower punch. 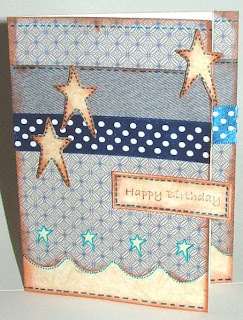 Still catching up with my birthday list, I made a card using the recent DCM challenge of a really useful sketch. Used up some of the bits left over from the PB album commission, one of my fave colour combos... pink and browns, just yum! 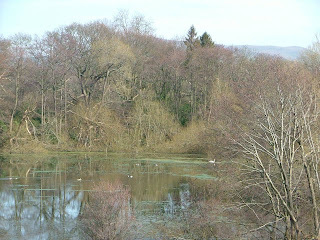 Discovered a useful link on the Paper Pleasing Ideas blog, its a colour scheme generator for want of a better description. Check it out here and see what you think! 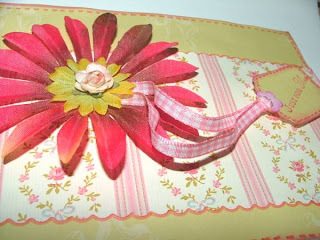 Ingredients: Anna Griffin paper, plain cardstocks, ribbon, ric rac, fabric flower from Wilko's and Fiskars scallop scissors (when I saw how Jo used them on her card, I just had to try it out too!). Went to a lovely wedding party this evening. A lady I used to work with got married today. It was such a lovely setting and really children friendly, they had two bouncy castles and some games available for children and the young at heart. 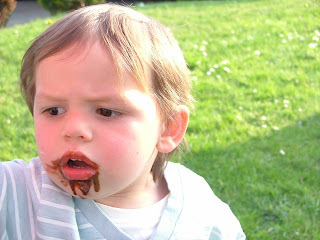 The sunshine really helped and their was a fab chocolate fountain for us to get messy with! 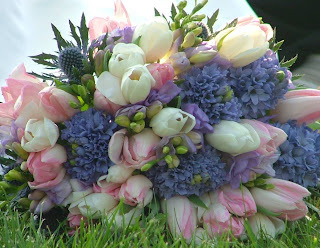 I just couldn't resist taking a pic of her bouquet, just beautiful! Nearly finished the Paper bag album... so hold on for those pics, have made some other cards too, but they're based on a Di Hickman sketch to be released soon... so again, watch this space! Yup, it's my birthday today, 21 again (+10). I think Tom had actually forgotten and was reminded by the postman! lol! Had some lovely cards and pressies. including... a Caft obsessions voucher, some money, a lovely house plant, a subscription to Good Housekeeping magazine, a shell paper punch, a couple of tops and a bar of chilli chocolate! In the frame and tagged! Had a go at the Wednesday Stamper challenge for the man's music themed birthday card I needed to make. Found this fab quote, hope he'll like it! 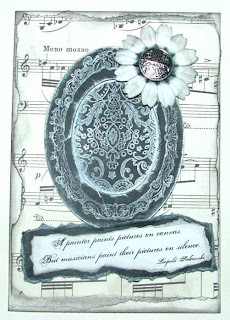 Ingredients: Frame stamp by All Night Media, background stamp in the oval by Anna Griffin, fower by Blooms to Go, button from my stash, quote from Quote Garden printed with Porcelain font, and a piece of sheet music as the background picked up from a charity shop. Esther has also gone and tagged me!!! Doing the list I am sure will be fine, but finding 7 people who haven't been tagged already will be the tricky one!!! I bought some Kola nut in London over the weekend, I have a feeling the last time I ate it was in Nigeria over 22 years ago! Eating salt and vinegar crisps when I'm feeling queasy really helps. I am mostly eating half a grapefruit for breakfast every morning, and sometimes have to do it secretly before Luke and Ethan spot me and want some too! I luurrrrvvveee Green and Blacks dark chocolate. I dunk gingernut biscuits for precisely 3 seconds in tea before devouring. Watch out everyone... it could be you..... Carolina, Beth, Tim, Rhiannon, Maggie Ann, Shannon and AJ! Well, he didn't call, more that him in concert in London did. Tom and I gave ourselves the rare treat of going out on our own... and went to see the legendary James Taylor in concert. We made a very long weekend of it and spent the time in London with friends and family. JT did us proud, his voice was was just perfect and he gave lots of background info to his songs and some insights into his life past and present. 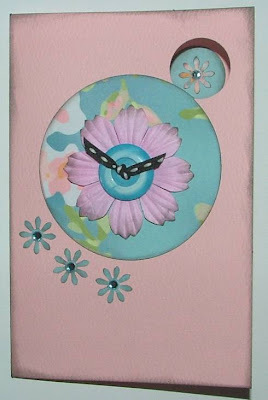 So you see, I have had an excuse for not blogging and cardmaking. 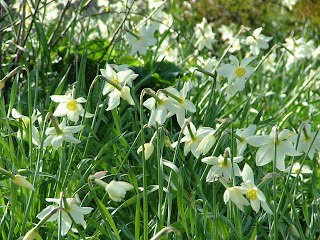 However I am severely behind on my April birthday list, unfortunately this month being one of the busiest for birthdays. Then I got a couple of card comissions today, a baby boy and a birthday card for a man who likes music. the boy one fitted perfectly with the current DCM midweek challenge and the Paper Squares current card sketch, the other card is one I'll need for my belated birthdays and was based on CPS's curent sketch. Did these cards for Di's recent sketch challenge, go on have a go, they're so fun! Check Carolina's new blog for lots of eatable ideas and recipes! She has 7 mouths to feed in her family and tries to do it as nutritiosly and tastily as possible. It's called tummylicious and promises lots of home cooking hints and tips! so go on, check tummylicious!!! 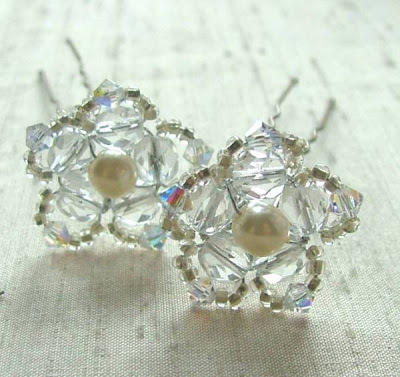 Got a super duper bargain from QVC outlet shop on Saturday, so been having a little play. 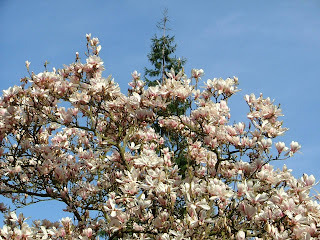 Been inspired by the Magnolia blog and all the wonderful colouring in they do of their stamps. So I had another play with my water colour pencils, paint brush and water. "Having somewhere to go is home, having someone to love is family, having both is a blessing." 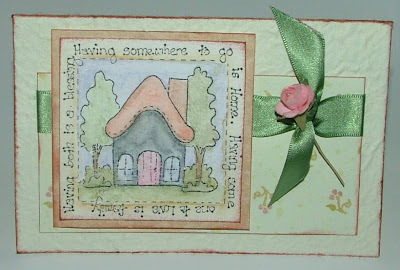 Ingredients: Home and Heart stamps, Primas, Brenda Walton and other papers. 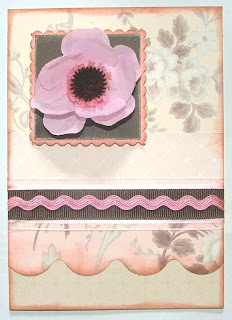 Ingredients: The frame has been inked with Pink Brilliance inkpad and Black Ink it Up, Anna Griffin and other paper, Quickutz bookplate, large flower from local source, Blooms to go, a nintage button, gingham ribbon and a charm. 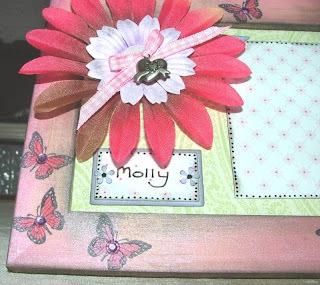 All Night Media butterfly stamp coloured with pen and a crystal stuck on. A lovely new shop has opened up in Welshpool called Lilli Mo's. Well, the ladies who run it used to run another shop in a different location and moved to these larger premesis. They do clothes altering and make make some gorgeous chabby chic aprons, heart bunting, bags and sell lots of other goodies for your home. They're also selling small gifts such as jewellery, pottery, candles and soaps. 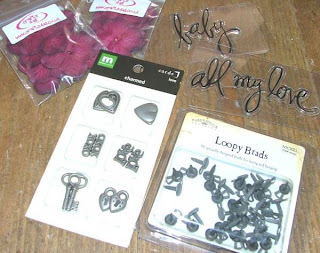 I had a lovely chat to the ladies a few weeks ago and told them I made jewelery and cards and they were interested in seeing what I do, so I popped in today with some bits and have left them there for them to try and sell. 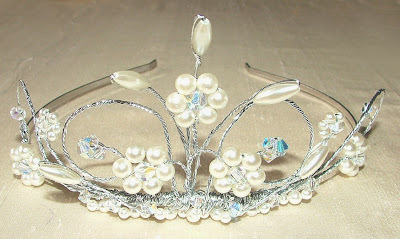 Here are the pics of the jewellery... its been quite fun to create with a free reign. 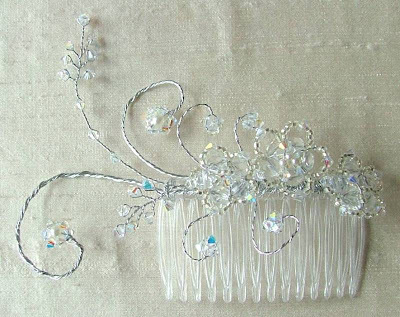 Ingredients: Swarovski crystals, glass beads, faux pearls and foil cpvered wire. 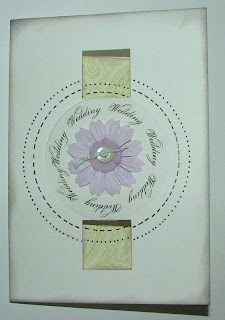 Inside pic of the card to prove there are 3 squares and 5 circles including the one on the inside, the button and the "wedding" word circle on the front. 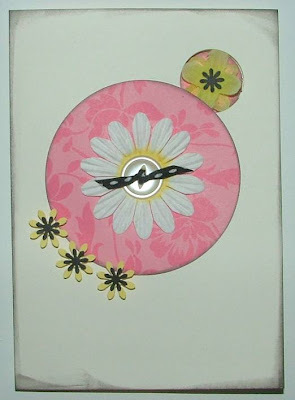 Ingredients: Anna Griffin paper, Blooms to go flower, charity shop find little flower, vintage button and fibre, my circle words printed on acetate and hand doodled circles...using my fiskars circle template. 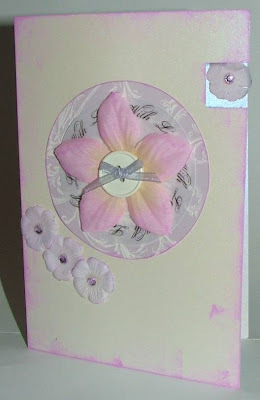 My second attempt, I was in a really girly shabby chic mood! Do you have any left over aperture cards when they were all the rage? 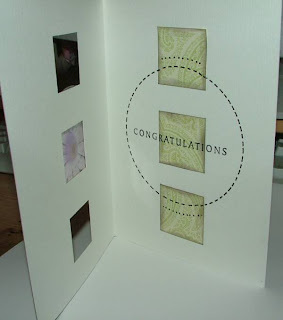 rather than using them in the traditional way why not leave them open and use them as a tri-fold card? Ingredients: Anna Griffin paper (again!) 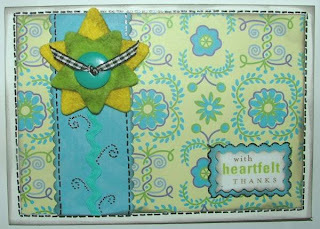 Clever cut, Anna Griffin and Hero Arts stamps, another charity shop find flower and vintage button and fibre. I had to pop out this evening to give a witness statement at my local police station, and look what I came home to... just had to take a pic! 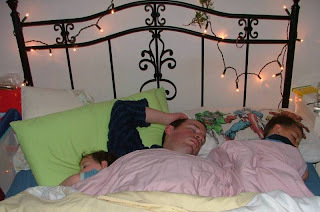 They look so comfy, I think I'll sleep in the back bedroom, yay! Double bed all to myself! Well, we've had an eventful couple of days, DH had a bout of sickness and diarrhoea, he's looking very trim now! Managed to get out to Ragamuffins, an indoor play centre in Chester. It was very impressive, particularly the food menu, not a mars bar, chicken nugget or fizzy drink in site! Some really nice homemade cakes and biscuits, organic juices and even packets of raisins! Highly recomended for any children in the Chester vicinity, and once you've paid for your children to get in, adults were free, and you could stay as long as you wanted!!! 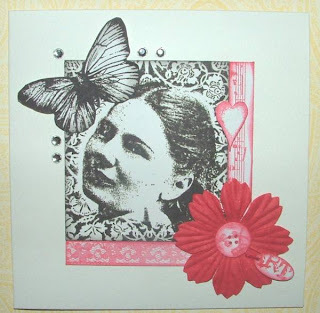 Discovered this lovely stamp after seeing it on Bety's blog, so I hunted one down on eBay. Bought a head of silk hydrangea flowers from a local florist, when i saw them I knew they were just destined for cards! 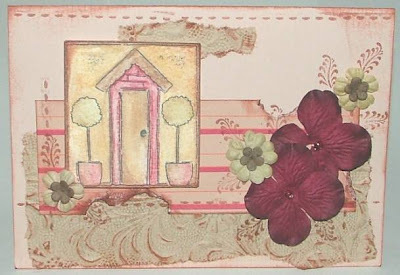 Ingredients: Anna Griffin paper and other from unknown company, Stampin Up and Clever Cut stamps, fibre, silk hydrangea flowers, fiskars scallop scissors and crystals. Had fun with the latest DCM challenge set by Rhi. I love the work of Mucha and thought I'd have difficulties interpretting his work. 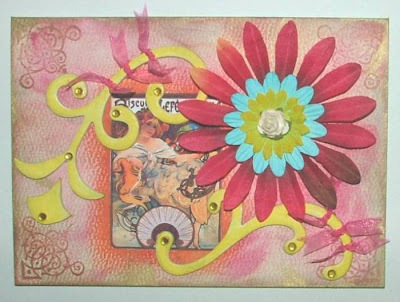 I've used one of his paintings as part of the card and highlighted colours patterns and textures through the inking, stamping, flowers, swirls and ribbon. I really enjoyed "working" the inkpads into the textured card. The sheer ribbon was an attempt to capture the more delicate quality if the lady's dress and hair. 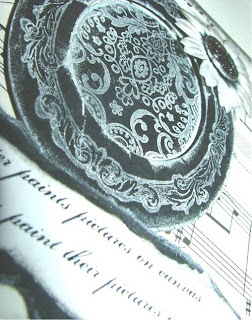 Ingredients: Mucha print from vintage images CD, chipboard swirls by TLC, blue flower by Blooms to Go, other flowers from various local sources, stamp by Clever Cut, crystals and chiffon ribbon. We've had a slightly unsual Easter Sunday, we tried to be on time for church, however, I was dettained rather longer than expected on the toilet! 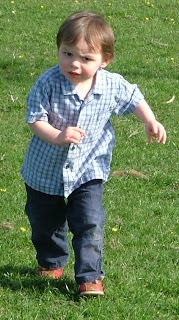 Then Ethan threw up 10 minutes into the journey to church so we turned back, changed him and tried to get there all beit 40 minutes late. 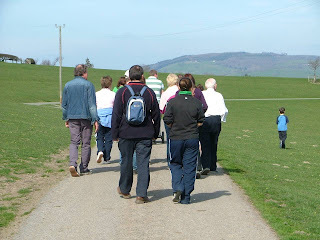 However it was not to be, he was a little sick again, so we turned back for home. So we're having a relaxing morning and waiting for a service on the TV and enjoying some Christian music. 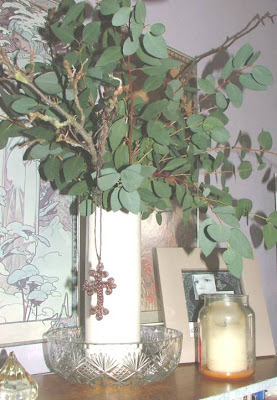 Had a pleasant few minutes rearranging my house flowers and an arrangement that was supposed to go to church! 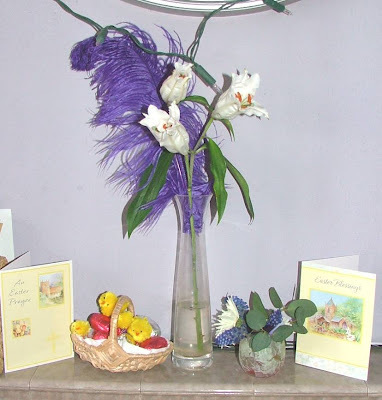 I don't wear a cross as I like to remember the power of the risen Christ, but this is a lovely handcrafted cross my sister bought me from Tanzania, I thought it would be appropriate to hang on my Easter arrangement, with the comfort that the cross did not hold Jesus there... HE is RISEN! I did this arrangement without the white chrysanths for church, but when we didn't get there, I added these and they are now sitting happily on the table the boys use to draw and eat from when they're in the front room. A little Easter collection of cards, chicks and easter eggs given to the boys from a lovely old lady called Enid who just spoils them rotten! 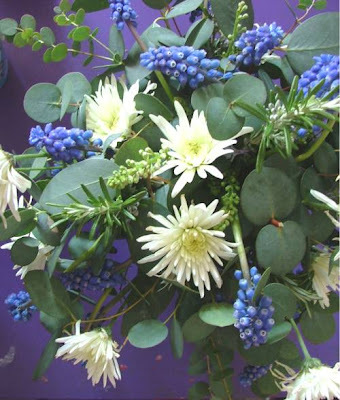 Thought the purple feeather picked out the grape hyacinths in the smaller arrangement. Been listening loads to some newly downloaded Stuart Townend songs, thought the words of this one were particularly apt for this day. I pray that you will know the true power of the Easter story throughout your life not just on this day. 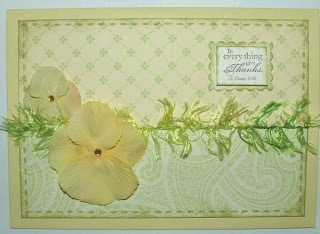 Wednesday stamper and Sketch this cards..2 hits in one! Sketch this cards! 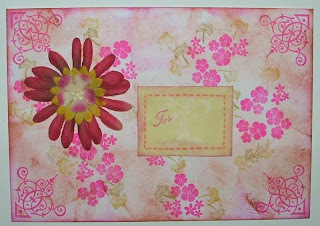 had a lovely sketch this week featuring two of my favourite elements, flowers and labels! 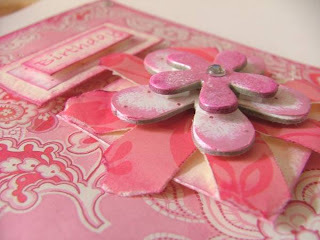 Wednesday Stamper's challenge was to decorate an envelope, so I did one to match the card... silly me though didn't check that it was the right size envelope before I did it, and have found that it is a fraction to small, never mind, like Cinderella's sisters I'll try and squeeze this one in! 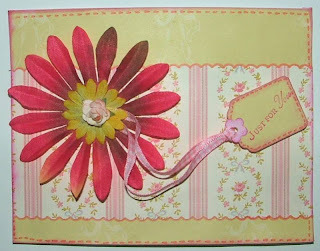 Ingredients: Anna Griffin papers, flowers from local sources, gingham ribbon, Quickutz tag and flower doodad, Anna griffin and Clever Cut stamps, and some hand doodling. Discovered a new card challenge site called Caardvarks through Bety, incidently she won the last challenge with her gorgeous baby card! 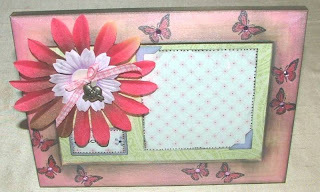 Ingredients: Paper by TLC and others, Quickutz star die, Fiskars large scallop scissors, EK Success star punch, Polka ribbon, hand doodled stitches and stamp by Docrafts. 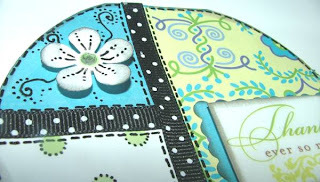 Get out your chipboard...your squares, rectangles, flowers, circles, even letters. Paint it, cover it with ink, cover it with paper...then stack it up! 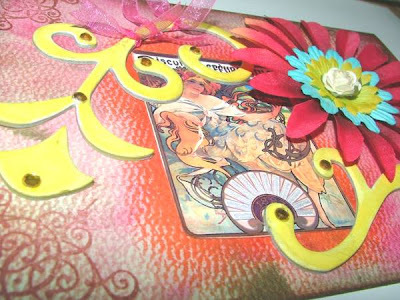 Combine your chipboard onto the front of a card. Assemble some squares and rectangles to create a base, and then stack some shapes on top, spell out a word, create a fun flower. Create some depth on your cards! 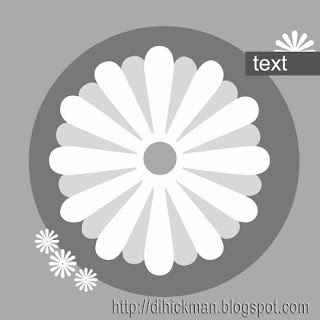 Further down in the blog there features a "torn" flower, so with inspiration from the sketch and the flower this is what I came up with. 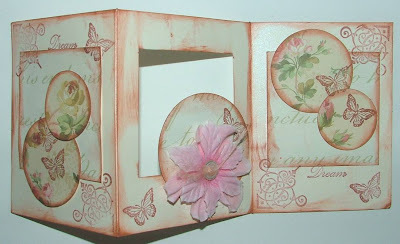 Ingredients: Anna Griffin and DCWV paper, TLC flower chipboard pieces, Do crafts stamp and some crystals. 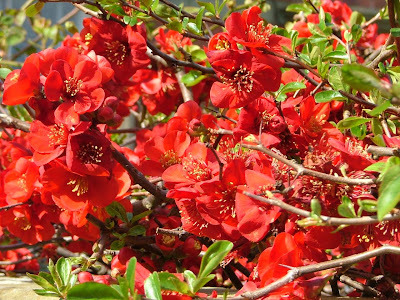 Although Easter can be "fluffed" away with all the bunnies, eggs, chocolate etc, it is a really special time for me as a christian to remember the amazing sacrifice of Christ for me and my sins. May the reallity of God's precious gift of his "Only, begotten Son" impact my life more fully. This weeks DCM extra dare was Verily Very Vintage, so this is my take on it, and what I can't believe is there's no vintage button in site! Authentic vintage lace though, I'll have you note! 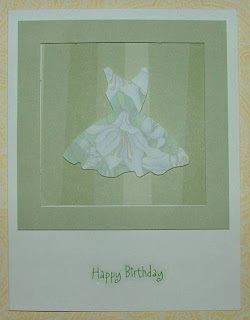 This card creation was timely as I forgot my aunt's birthday this week, and i think she'll like this! 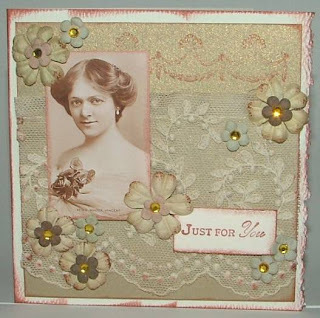 Ingredients: Vintage Lace, Prima flowers, repro vintage photograph, Anna Griffin stamps and gold coloured crystals. Playing with Page Maps and cardboard shields! Baby no 2 is 2!! !